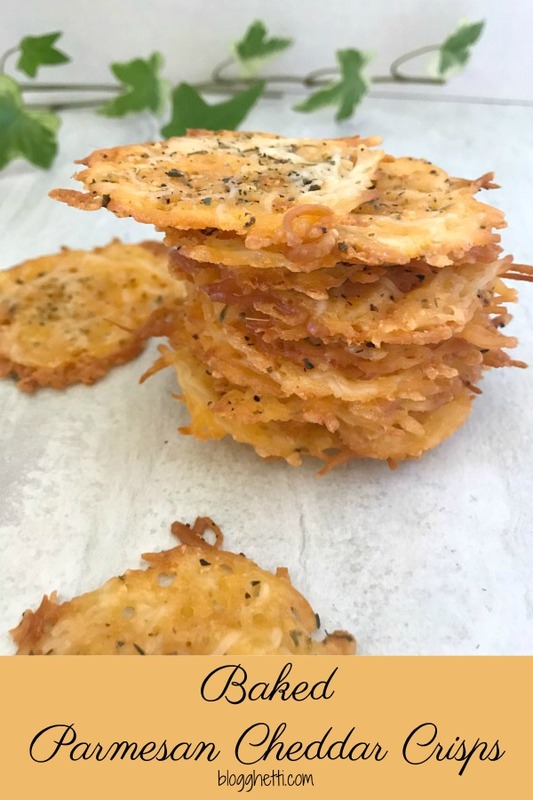 Baked Parmesan Cheddar Cheese Crisps are super easy to make and they are the perfect low-carb snack. Perfect for when snack cravings hit. Some of the items below contain affiliate links; I am a participant in the Amazon Services LLC Associates Program, an affiliate advertising program designed to provide a means for us to earn fees by linking to Amazon.com and affiliated sites. It does not change the price you pay. , I only promote things that I love and think you will love, too. I don’t keep salty snack foods that I like in the house because it’s just too much temptation. I rarely crave salty foods but when I do, I want them immediately. In an effort to get healthier, we’ve eliminated certain foods from the house and our diets. Some, like those yummy yeast rolls at our favorite restaurant, we will have in moderation. Cheese is one food that I love and I can’t give it up but I can enjoy it occasionally. The salty craving hit me the other day and we had nothing that would give me that immediate fix in the house. It was a nasty cold and rainy day so I was not about to go out for a bag of chips. So, I did the next best thing – I made my own healthier salty-ish snack – with cheese. When you bake cheese, it becomes crisp and has a little saltiness to it, like a cracker almost. Perfect quick and low-carb snack. If you’re following that kind of diet or Keto, this is a perfect snack. I took it one step more and broke a few up over my salad instead of using croutons. Gives that salad a bit of extra cheesy crunch. 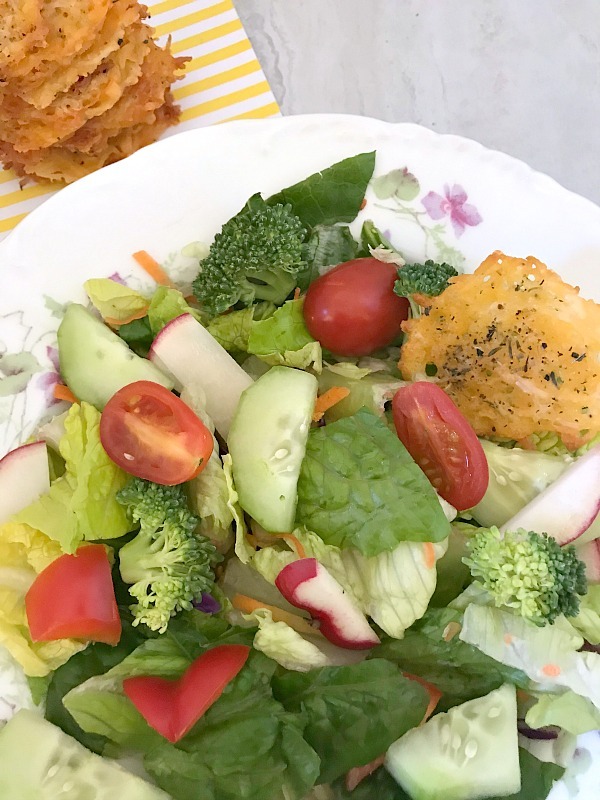 These Baked Parmesan Cheddar Crisps are a cinch to make. It’s just cheese and a bit of Italian seasoning. You could just use one kind of cheese and this would be a one ingredient recipe. I like the combination of Parmesan and sharp cheddar so that is what I used. Did you know that today is National Cheese Lovers Day? So, this is a perfect way to get that cheese – in snack form. I’ve joined a few other bloggers to share out love for cheese with recipes. You can see them all below the recipe. Cheeses with low-moisture work the best. Line your baking sheet with parchment paper – trust me, your pan will thank you. No need for any type of nonstick spray. Don’t feel limited to using Italian seasoning. Garlic powder is great to use, as is dried rosemary. Use what you like. 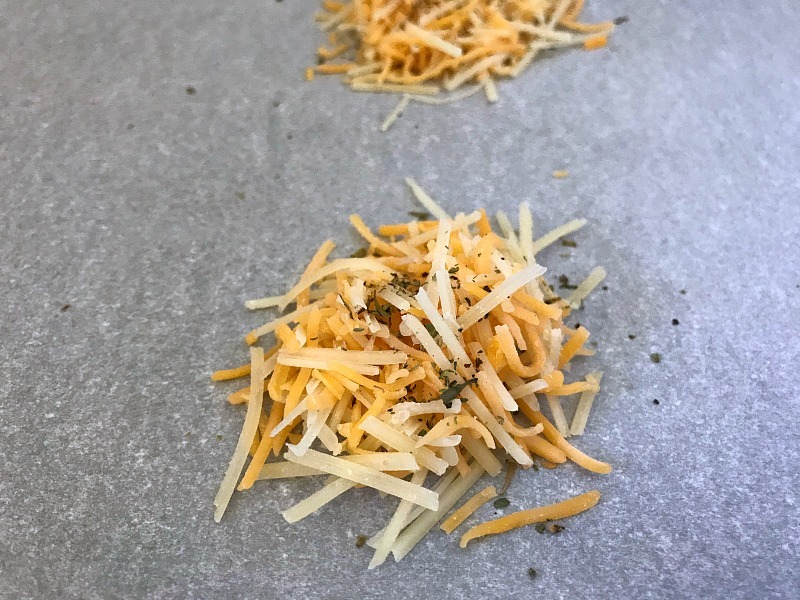 When placing your cheese heaps onto your baking sheet, don’t mound them up too high, you want the cheese to spread out into a thin layer when melting and bake evenly. Keep the piles small and leave space between them. Carefully watch the crisps as they bake, they can go from “almost done” to burnt in a hot second. On the other hand, if you take them out too soon, they won’t be as crisp as they should be. Don’t skip the cooling of the cheese crisps on a paper towel. The paper towel is there to absorb any moisture from the crisps. 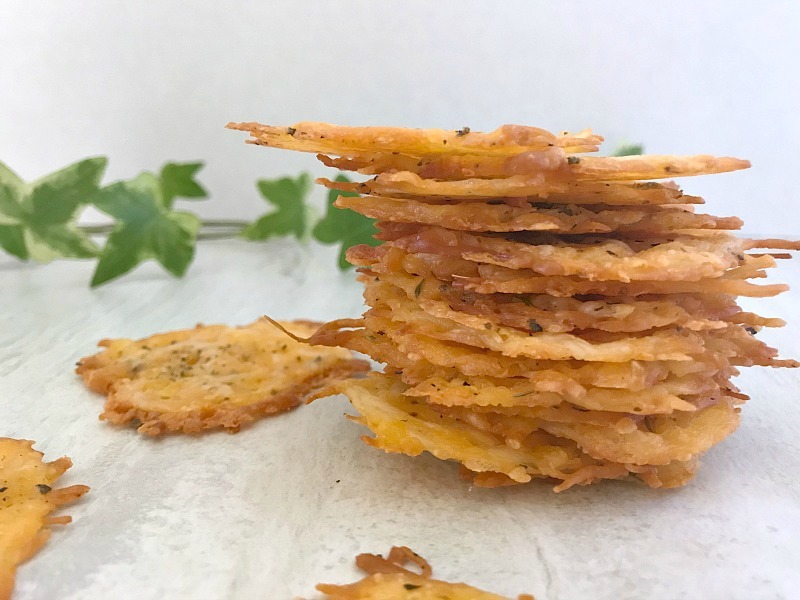 Baked Parmesan Cheddar Cheese Crisps are super easy to make and they are the perfect low-carb snack. Combine the cheeses together in a small bowl. Place a tablespoon-sized heaps of the shredded cheeses onto the baking sheet. Leave about 2 inches between each as they will spread out while baking. 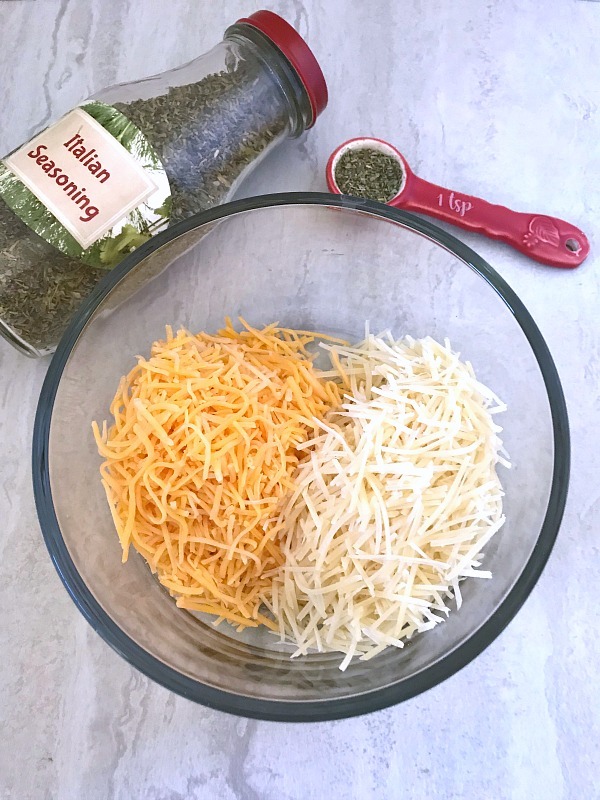 Sprinkle each cheese heap with Italian seasoning. Place in the oven for 6-8 minutes, until the edges start to brown. (Be sure to watch them carefully, as they go from almost done to burned quickly. Allow the cheese crisp to cool slightly in the pan,about two minutes. Then transfer them to paper towels to get crispy. The paper towel will absorb any moisture from the cheese crisps. We love parmesan cheese crisps. Most of my family is on a type of low carb diet. These crisps add the salty crunch that they crave. I’ve always wanted to make these. My favorite part of making pizza is stealing that cheese that drips off the top and cooks on the pan all by itself. This was nearly what I shared as well. They are so darned good!!! I love how versatile these cheese crisps are…so many options!!! I’ve had these out before, but have never been brave enough to try them at home. Yours look perfect ! Thank you, Jolene! So easy to make, you can’t mess it up, I promise. I have bought Parmesan crisps from the store before but have never made them homemade. But you make it look so easy that now I have to try! Easy to make and knowing exactly what’s in them is a huge bonus! This would be a great idea for salad toppings! Great in a bowl of tomato soup, too! I love cheese crisps! They’re so good served with a great salad or soup and bring so much texture and flavor to any dish! What a wonderful snack or topping for a salad or soup! I did not realize how simple this was to put together, and can’t wait to give it a try!